Thanks for visiting our gallery page. Here you will find pictures that highlight our casing jack's unique features and versatility. We've seen it time and time again. 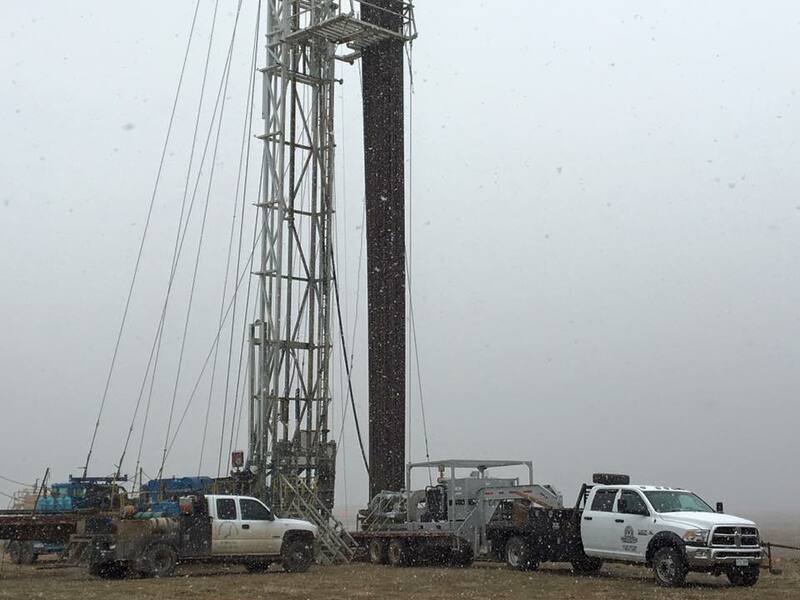 Once a customer uses our casing jacks to pull stuck slips, they never want to risk over pulling with a rig. Our casing jacks are designed to fit directly on the well head flange. This means a small foot print, no need for beams, and the versatility to be down in a cellar, up on a BOP or set on a drilling rig floor. The work basket attaches to the top of the cylinder mounting plate and allows the traveling head of the jack to continue to move independently of the basket. All Casinjacs have well head adapter plates that can be custom machined to fit the most common flanges a customer uses. Here you can see the bolts securing the casing jack to the flange. Casinjac's symmetrical design allows for 2 speed operation. Two opposing cylinders can be valved off and unpinned. This cuts the lifting force by half, but doubles the cycle time. All of our field service units are load tested by an independent 3rd party to ensure our customers have the safest equipment available on their locations. Another picture of the testing. All of our field service units are load tested by an independent 3rd party to ensure our customers have the safest equipment available on their locations. The pad eyes are instrumental in mounting the Casinjac safely. All of our service unit pad eyes are pull tested by and independent 3rd party. Casinjac takes a very proactive to safety, one example is the whip-checks installed on all our field service units. Many times pulling production slips on a well is beyond the safe operation capacity of the rig. Using a casing jack to pull these slips is a much safer alternative. We have many sizes of jacks available for rent. We can arrange hot-shot delivery or you can pick them up from our shop with your truck and driver. Casinjac's small foot print means our casing jacks can be used in tight work spaces. Working with the rig crew, a jack can usually be mounted on the flange in 3 to 5 minutes. In addition to our Service Trucks, we have larger field service casing jacks available for maximum pulling power. Model 282 casing jack mounted on a BOP. All Casinjac's have a well head adapter plate designed to bolt the casing jack to a flange or in this case a BOP for added safety. All Casinjacs have a bottom bowl assembly that can be lowered in order to set bottom slips. This allows the top bowl to lower and get another "bite" of casing, rasing again and pulling more of the joint free. When working with the huge pulling forces our jacks produce, its important to know exactly how much force the casing is exposed to. Our trucks are equipped with precise digital instruments. Sometimes after pulling for a customer, we're asked to stay on the flange in the event the casing has to be pulled through a tight spot. This keeps the rig crew and equipment safe since we're doing the heavy pulling. When larger jobs call for greater pulling power, we have a fleet of service units available to meet your needs. Casinjacs allow plenty for space for the rig crew to get in and work around the unit. While drilling rigs have massive pulling capability, a Casinjac has a much more precise and steady pull. This was necessary in this case as the casing was stuck shallow and the customer did not want to risk parting the pipe. All service units have modular components that can be removed from the trailers and moved closer to the well. This allows for maximum flexibility, no matter how tight the job site is. When we reintroduced field services, this was our first unit.